AWD Group (Formerly Dieci) Executive Chairman Paul Jenkins says the new group is also about to launch another product. But as yet he says it's too early to publically announce the details. "There will be Dieci, Rough Terrain Plant Hire, AWD Services, AWD Parts Distribution and one other brand," Jenkins says. Jenkins, who has been with the company seven years is one of the driving forces behind the change. He says the rebrand has been coming for some time as the business expands into new product and service areas. For example it recently incorporated a rental business Rough Terrain Plant Hire. "We run the two companies in parallel, even though there is some cross pollination between them," Jenkins says. "As we move forward we need to add more products to our range for both our rental fleet and our customers and dealers who want a broader range of products for sale." On a daily basis the Dieci, now AWD head office and warehouse facility at Ingleburn in Sydney ships out about $60,000 worth of spare parts and moves about five to ten machines across rental, service and sales. 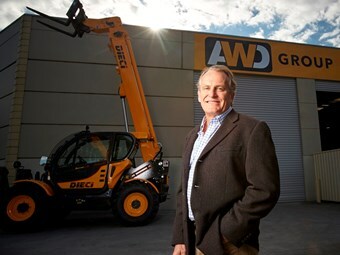 Jenkins says the transition to the AWD Group as ‘The Capital Equipment Specialists’ will enable the sale of other products other than Dieci and house the rental and selling opportunities more logically together. "We already service every brand of telehandler, our fleet of service vans fix all sorts of machines," he says. "We quite often have excavators, skid steers and forklifts at our Ingleburn facility. "If it’s got a diesel engine and a set of hydraulics, air conditioning or auto electronics we can do it. Jenkins adds the new brand will stop the confusion when servicemen go out to a site wanting to maintain a customer’s whole range of equipment. "Currently they have to explain they’re not just a Dieci service technician and they don’t just know about Dieci products," he says. "We will still stock Dieci telehandlers but under the new structure the group can offer a broader range of products. "We already do this, but rebranding the company formalises the process and makes it easier for customers to understand." The AWD Group will keep all its current brands. "We still have a very close association with the Dieci brand and we will have a Dieci division that just focuses on Dieci product as before. "But we can’t continue to grow the company with telehandlers only." Dieci has been making equipment for 52 years. As a pioneer in the telehandler space, the company introduced the first telescopic boom and telescopic reach fork lifts in 1983. Don't miss the full story in issue 25 of New Farm Machinery on sale August 17.